The Blue Tick Coonhound is loyal and intelligent. It has a variety of barks for different situations and makes an excellent watchdog. Blue Tick Coonhounds are good problem solvers who should not be restrained to a small house or yard. They bark frequently and tend to drool, especially when they smell human food. 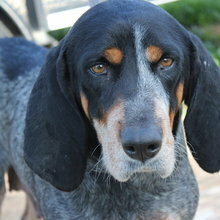 The Blue Tick Coonhound is loyal and intelligent. It has a variety of barks for different situations and makes an excellent watchdog. Blue Tick Coonhounds are good problem solvers who should not be restrained to a small house or yard. They bark frequently and tend to drool, especially when they smell human food. The Blue Tick Coonhound will bark at and sniff strangers, but this is actually their method of greeting and does not indicate aggressiveness. The Blue Tick Coonhound is always ready to sound the alarm when bothered by someone or something creeping around. Blue Tick Coonhounds have a high tolerance for children and other animals, provided they have been socialized when young. You can find Blue Tick puppies priced from $150 USD to $800 USD with one of our credible breeders. Browse through our breeder's listings and find your perfect puppy at the perfect price. Blue Tick Puppies for Sale - Shipped Worldwide! Finding the right Blue Tick puppy can be dog gone hard work. PuppyFind® provides a convenient and efficient means of selecting and purchasing the perfect Blue Tick puppy (or Blue Tick puppies) from the comfort of your home, 24 hours a day, 7 days a week. Take advantage of our PuppySearch or leisurely browse our directory of hundreds of dog breeds, Blue Tick dog breeders, Blue Tick dogs for adoption, and Blue Tick puppy for sale listings with photos and detailed descriptions. Some Blue Tick puppies for sale may be shipped Worldwide and include crate and veterinarian checkup. Many Blue Tick dog breeders with puppies for sale also offer a health guarantee. With thousands of Blue Tick puppies for sale and hundreds of Blue Tick dog breeders, you're sure to find the perfect Blue Tick puppy.